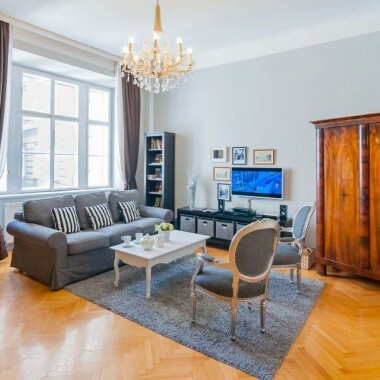 This beautiful rental apartment is centrally situated in Lindengasse, Vienna, just behind the main shopping street of Mariahilfer Strasse, on the 1st floor of a magnificent historical building. Lindengasse is at the heart of the Neubau creative district, and also a bustling hub of contemporary fashion with numerous small boutiques. 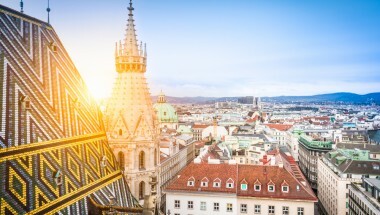 The Museum Quarter is just ten minutes walk away, with the impressive Leopold Museum, with its huge collection of paintings, including works by Klimt and Egon Schiele. The area also has an abundance of restaurants and cafes to choose from. The building has an impressive grand staircase, and does have an elevator (the apartment is only up half a level from the ground floor, so those wanting to use the elevator, would go to the 1st floor, then walk down a couple of steps). The elegant and spacious (192m2) accommodation comprises an spacious and sumptuously furnished living room, a large living/TV room and a modern kitchen with dining area, all with high ceilings, with period plaster mouldings. The attention to detail here is outstanding. The enormous, comfortable beds have soft linens and cosy duvets, with fluffy towels and toiletries in the bathrooms. Amenities include wide screen satellite TV, DVD, a PC and wi-fi internet, as well as both heating and air conditioning, and a washing machine and dryer. There are also two portable single beds available, suitable for children. Large hallway with desk, with PC, drawing room, a TV/living room, dining area, modern kitchen, two double/twin bedrooms, one with en-suite shower room, plus another bathroom. Guest WC. This beautiful apartment to rent is centrally situated in Lindengasse, Vienna, just behind the main shopping street of Mariahilfer Strasse. Lindengasse is at the heart of the Neubau creative district, with numerous small boutiques. The Museum Quarter is just ten minutes walk away, with the impressive Leopold Museum, with its huge collection of paintings. The area also has an abundance of restaurants and cafes to choose from. Minimum stay is 3 nights. Please check with us for nightly prices for stays of less than one week.